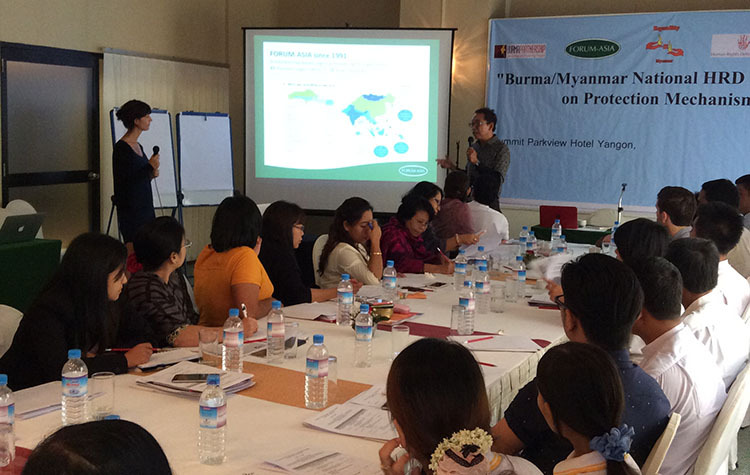 The Asian Forum for Human Rights and Development (FORUM-ASIA), together with its member Equality Myanmar and partner Progressive Voice, is organising a 2-day Follow-up Workshop from National Human Rights Defenders (HRDs) Consultation on Protection Mechanisms 2015 on 21-22 October 2016 in Burma/Myanmar. Around 25 young activists from ethnic minority regions, conflict areas and rural areas will participate in the workshop. The main aim of the workshop is to train young activists from ethnic minority regions and remote areas to increase their capacity in conducting international human rights advocacy and enhance the level of their protection. It also aims to develop further strategies and action plans for the sustainable coordination of a national HRD network in Burma/Myanmar. The creation and consolidation of stronger HRD networks at the local level is necessary to enhance the protection for HRDs on the ground, to facilitate coordinated support, to assist HRDs at risk, and to strengthen the national human rights movement.